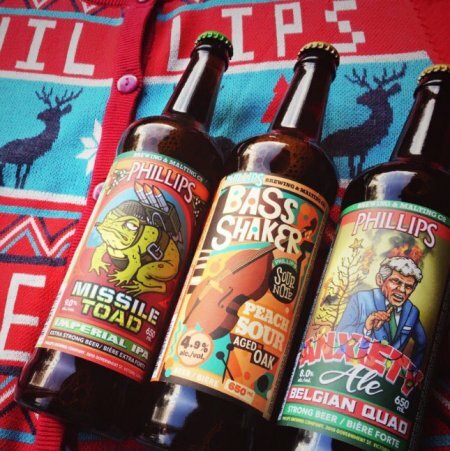 VICTORIA, BC – Phillips Brewing has announced details of three new limited edition brands that are being released just in time for the holiday season. Missile Toad is loaded with fruit forward Ella hops from across the pond (New Zealand), to create a double IPA worth croaking about. Tropical fruit, citrus, floral and spicy – this brew covers most of the range of hoppy flavours in one bottle. Though “balanced” is not usually associated with the IIPA style, Missile Toad drinks extremely easily with a dry finish and a bitterness that doesn’t hang around. The Sour Note Series plays on with Bass Shaker: a sour ale brewed with peaches and aged in oak. Like all sour ales in the series, this beer was soured with our own in-house lactobacillus strain. On the palate, ripe peaches and careful aging with medium-plus American oak chips impart subtle nuances of sweet charred fruit and vanilla. Very tart. All three beers are available now in 650 ml bottles at the Phillips retail store and select private liquor stores in BC while supplies last. They will also be featured on draught during a launch event at the brewery on Thursday November 24th from 4:00 to 6:00 PM.